Simon Kerr on Hedge Funds: Risk Managers are the Social Workers of Asset Management? Risk Managers are the Social Workers of Asset Management? Recent research has shown that in the UK 86% of youth workers/social workers time is spent in completing forms for reporting, and in attending meetings about clients and how the services are run. Only 14% of time is spent with clients. This skewed sense of priorities came to mind when I read the 2011 Risk Management for Asset Management survey from Ernst & Young. In the survey there is a section about how risk managers in asset management companies use their time. The collated responses are in figure 1. If this survey reflects the reality of how risk managers are spending their time risk monitoring takes up 10.8% and risk reporting takes up 9.7% of risk managers' time. I would like to think that the label "general risk management and client contact" applies to time spent with portfolio managers and analysts, but it is more likely to be with the Head of Equities or Chief Investment Officer, or in some client meetings. Rather like IT spend in an asset management business, it seems that most of the budget (budget of the time in this case) is on the hygiene factors - the necessary operational systems (activities). At the moment there is lot of hygiene stuff to take care of in risk management in asset management businesses - tax related issues, KIIDs, increased burden of regulatory reporting and compliance, liquidity issues and not least counterparty issues. But where is the main event at the moment? Is it not in the markets - the challenges to the business models of asset management businesses, real time stress tests of portfolio managers and their approaches to markets, the very viability of the financial sector in Europe? What are risk managers spending time on? 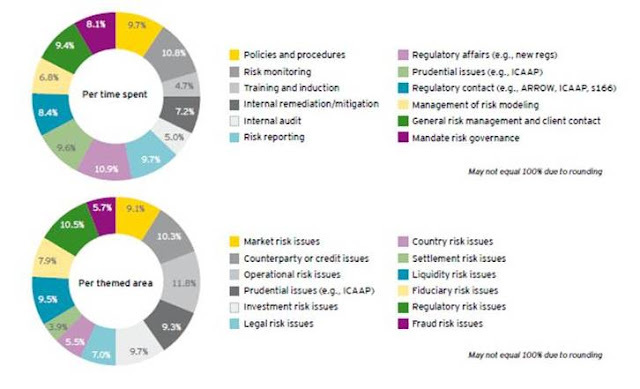 : regulatory affairs and contacts with regulators are taking up twice as much time as risk monitoring; country risk assessment is taking up less time than fraud risk. In an inversion of the prevailing norm in social work, in a project in Swindon that works with chaotic families 60% of the budget is now going on selected face-to face service provision. This puts a bigger priority on the work that is the raison d'etre of the service, rather than its reporting processes and management. A good risk manager can be a very positive influence on keeping the assets under management. The risk management function should help avoid blow-ups and gap risk, and assist finding useful hedges at the company level as well as the portfolio level. Good risk management is a long way from being just a quasi-compliance officer with a numerate degree. But the priorities and resources have to be agreed and in place for a fully realised risk management function to work as it can. Asset management companies should do a Swindon.